If you are newly engaged or just starting to plan your wedding you might have already found out that one of the most important decisions you’ll make is the location of your big day. Here are some important questions to ask when you are shopping for wedding venues. One of the first things that you are going to want to figure out when you begin to wedding plan is the amount of guests that will be invited. The reason for that is because so many important decisions are going to be made based on the amount of people that will be there, including the event space. You aren’t going to want to waste your time touring a venue if it cannot accommodate your guests. Most of the time this information can be found on the venue’s website, but if it is not I would suggest calling and asking before you even spend the time touring the space. What is the total price of the venue and how much is the deposit? To help you stay in your budget or create your budget you’ll need to know the cost of the venue. 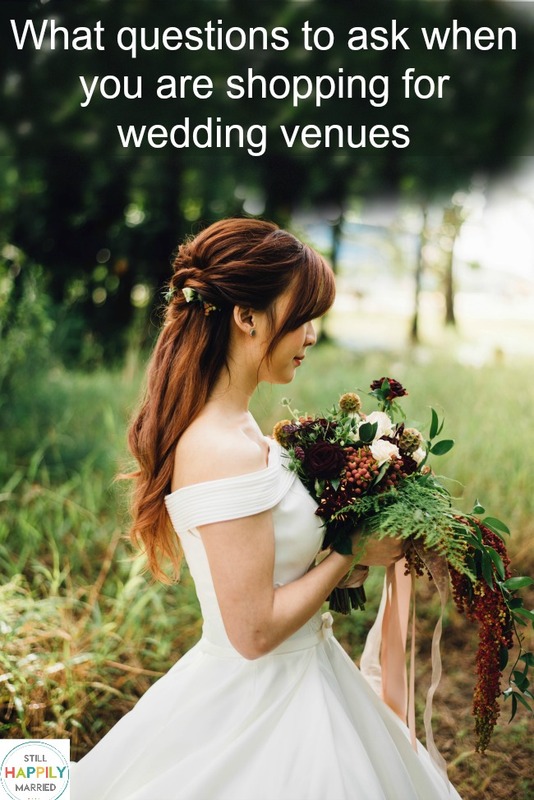 In many cases the venue is the largest expense so it may determine the amount you can spend in other areas if you have a predetermined budget. Also be sure to ask how much the deposit costs and when the deposit is due. Most venues require a deposit to reserve your date. How long do you have access to the venue? More popular venues may have time slots where they hold several different weddings per day. Unfortunately, that means that you only get a predetermined amount of time to set up, occupy, and clean up your wedding and reception. If you know your wedding is possibly going to run long and the venue requires you to be cleaned up and out of the area by 10PM, you might want to reconsider using that venue. Does the venue supply tables, chairs, and linens? If the venue you choose to rent does not provide tables, chairs, and linens then that is another expense that you are going to have to add into your budget. Before you rent a venue you are going to want to be sure that you are clear on whether or not those items are included in the price of the venue. Some venues supply not only the previously mentioned items, but they will also provide the catering and wait staff. In fact, some venues will require that you use their catering service for your wedding. A good way to find out these answers is to ask what services they provide and if they allow outside vendors if you choose to use someone else. What rooms will be available to you on your wedding day? Most bride and grooms prefer to have a place to get ready at the actual venue rather than getting ready and then transporting to the wedding so it is a good idea to make sure that there are bridal suites available for your big day. Another important question that you might want to ask is whether or not you will have access to the venue to shoot your bridal portraits. This may not pertain to every bride, but for the ones who plan on taking bridal portraits this might be an important question to ask. What is the alcohol policy of the venue? The answers to this one will probably vary from state to state, but if you are planning to have alcohol at your wedding there are a few questions you will need to ask your venue beforehand. Can we provide our own alcohol or does the venue provide alcohol? Do we have the choice between a cash bar and an open bar? Is it our responsibility to hire a certified bartender or do you provide one? Are we required to hire security for the night if we have alcohol at our event? A wedding is a huge expense and a day that you will never forget so don’t forget to ask these important questions to be sure that your dream day is all that you want and more.